This trail parallels the old road that connected Rutland to Proctor over Pine Hill from late 1700’s to late 1800’s. By the early 1900’s, this road was known as the Stage Road on the Proctor end and would take you up to what is now Reynolds Reservoir and a little bit beyond. Reynolds Reservoir was the water source for the town of Proctor back in 1930’s and is now a lovely scenic pond. At that time the hillside was pasture with little or no forest. A branch of old Stage Road went north and wrapped around Pine Hill ridge and was a section of the Crown Point Road during the Revolutionary War. It came out near Pinnacle Ridge Road in Rutland Town. 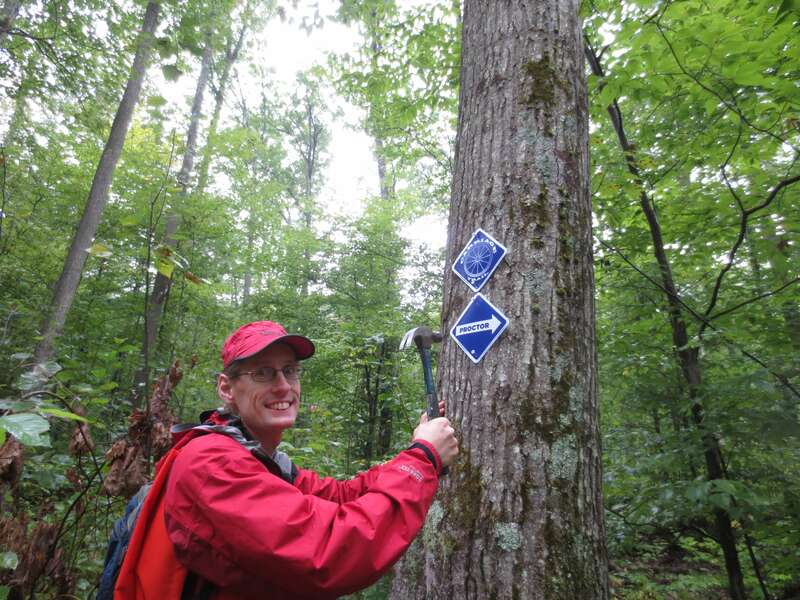 We knew this trail was going to represent a challenge to volunteer groups in repairing the old logging roads because of their remoteness. In 2011, Pine Hill Partnership applied for and received a grant from VTrans (Vermont Department of Transportation) to have VYCC (VT Youth Conservation Corp) come in and work on the more remote parts of the trail. VYCC worked for three weeks in 2013 and completed the most difficult portions of the trail. VYCC returned in 2014 continuing to work on drainage issues. The Carriage Trail trailhead is at Pine Hill Park at Giorgetti Complex on the Rutland side and Proctor Skating Rink on the lower end of Olympus Road on the Proctor side. 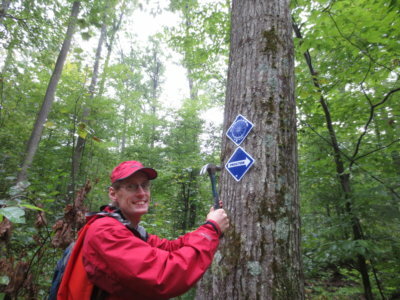 The trail is 5.1 miles long (one-way) with moderate/difficult elevation gain in the middle. Please stay on the blazed trail and respect private landowner’s property. Do not to stray off onto other logging roads as they mostly lead you dead ends. The Carriage Trail is marked with royal blue blazes.